Lombard Street San Francisco is one of the most crooked streets in the city. This one block stretch between Hyde and Leavenworth Streets includes eight tight turns. It's on the northern side of the city in the Russian Hill district. How did it get this way? In the 1920s, many residents on the street were interested in buying cars. The problem was they couldn't drive down such a steep hill (27% grade). One of the residents had the idea to decrease the grade by creating turns in the road. When it originally opened, cars could drive both ways on the crooked road. This created some challenges, so they eventually turned it into a one way heading east. Did You Know? 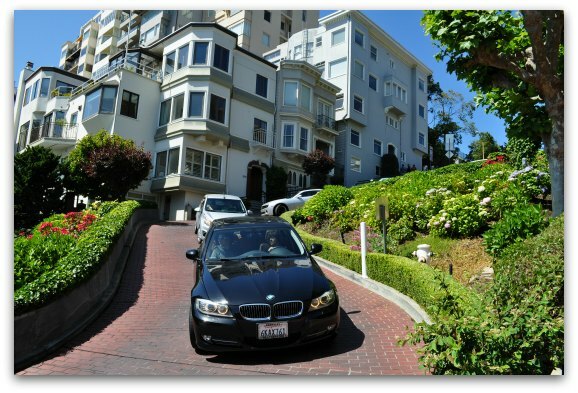 Even though Lombard Street San Francisco is often referred to as the "Crookedest Street in the World," it isn't. It isn't even the crookedest street in San Francisco! That title goes to Vermont Street in SF's Potrero Hill District. However, people still flock to Lombard Street due to its beautiful brick roads and colorful gardens. A visit to this San Francisco crooked street is quick. The only thing to do here is either walk or drive down this steep hill. However, it is easy to get to and is close to several other San Francisco attractions. Both driving down and walking give you a great sense of the tight turns on it. For those walking down the hill, there is a set of stairs on both sides, so you can easily make your way down on foot. For those driving, you will probably have to wait in line for your turn. I recommend heading over early in the morning or during the day on a weekday. It gets really crowded on the weekends, so plan on waiting in line for a while if this is your only option. Most people enter Lombard Street San Francisco at the top of the hill. This entrance is at Lombard and Hyde Streets in the Russian Hill district. This is where cars enter to drive down and where you can access the stairs that lead to the bottom of this SF attraction. If you plan to drive down the hill, you are not allowed to turn directly from Hyde Street into Lombard Street. This is because it impedes through traffic and the cable cars on Hyde Street. You can turn onto Lombard Street starting at Larkin. There is often a line of cars to drive down this attraction, so allow for at least 30 minutes or more to wait in line. Lombard Street between Hyde and Larkin is also very steep. As you wait in line, you will be inching your way up the hill. Don't get too close to the cars in front of you as many roll backward a little as they inch their way up the hill too. 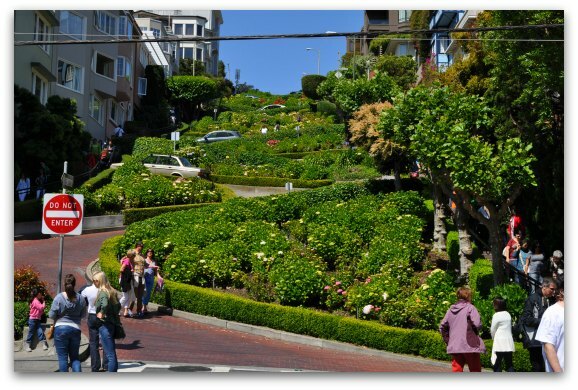 When is the best time to visit Lombard Street San Francisco? This SF attraction is free and open 24 hours a day, 7 days a week. However, I always recommend visiting in the morning. This is when the sun is shining on this lovely street and when you will find the best light for pictures. 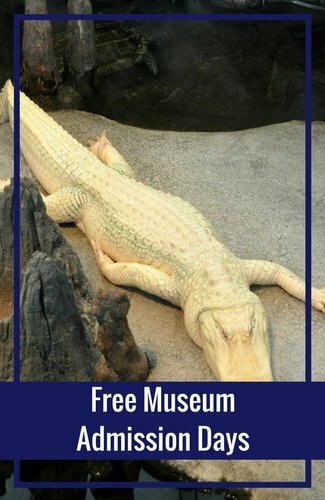 On busy days, this popular attraction draws in almost 20,000 people! If you want to learn more about this famous attraction, there are several tours offered that include a visit in their itinerary. Here are a few top options. 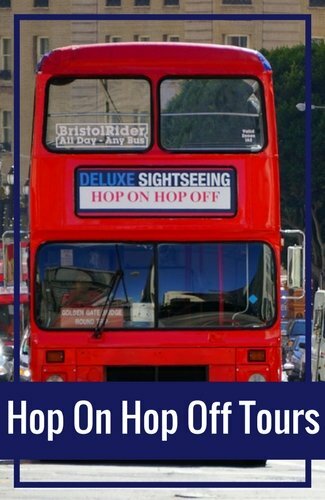 One of the best ways to get from top attraction to top attraction is the Hop On Hop Off Bus Tour. 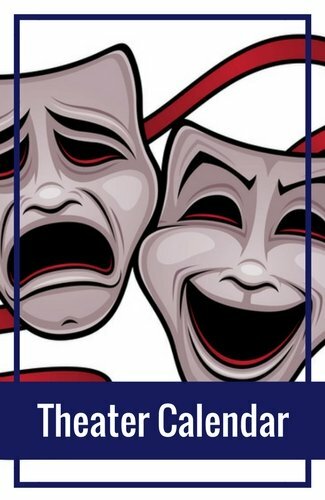 This tour includes stops all around the city. 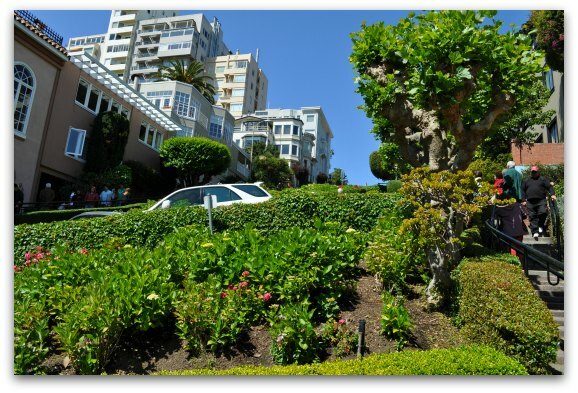 There is a stop here at Lombard Street San Francisco as well as other top attractions including the Golden Gate Bridge, Golden Gate Park, and Alamo Square. The 2-day is the most popular which includes 48 hours of access to these buses. The tours run from 9am to 5pm daily with buses every 15 to 20 minutes. This gives you plenty of time to check out top stops and learn more about them as you cruise around SF. If you want to get your heart pumping, the check out this Urban Hike. 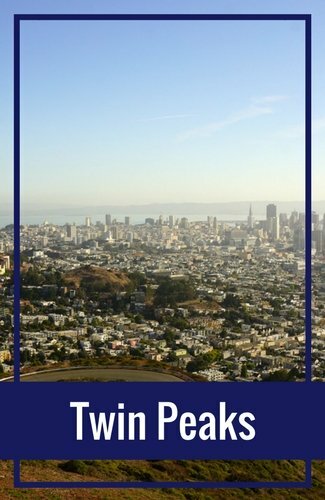 It starts at Levi's Plaza, takes you to the top of Coit Tower, down the hill to explore North Beach and then up the hill to the top of Lombard Street San Francisco. This 3-hour hike is strenuous and best for those that love to climb steep steps and hills. As you hike, your knowledgeable guide will tell you all about the hidden treasures around you and these top attractions. Sit back, relax and enjoy this bus tour of San Francisco. 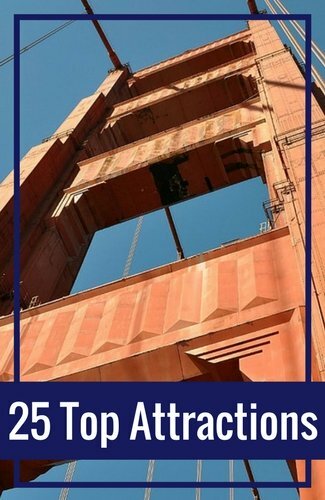 During this five hour tour, you will learn all about SF's history and our top attractions. 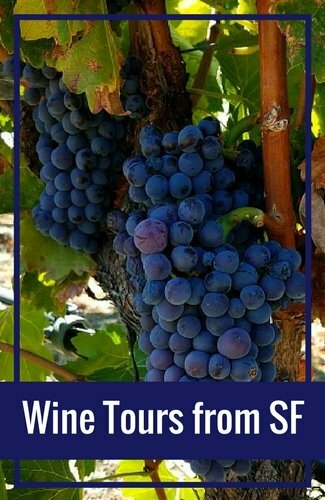 The tour starts with a ferry ride over to Sausalito where you will get great views of Alcatraz and spend an hour exploring this lovely waterfront village. You will then make your way over the Golden Gate Bridge and stop for a photo. 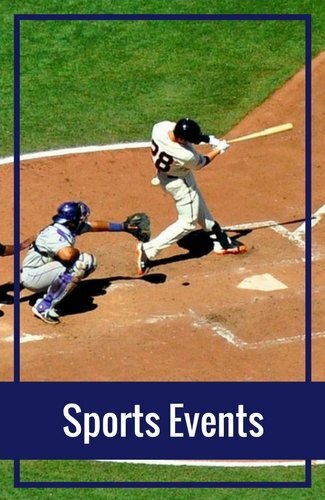 Your tour continues with stops at Alamo Square, Lombard Street San Francisco (where you will walk down the hill with your guide), the Palace of Fine Arts and others. A fun way to get over to the crooked Lombard Street is by taking a cable car. The Powell/Hyde line drops you at the top on Hyde Street. You can then explore it and hop back on to head to your next adventure. With the San Francisco CityPass, you get unlimited rides on the cable cars for three days. This saves you both money and the hassle of always looking for change. More Options from Fisherman's Wharf: The western side of Fisherman's Wharf is just a few blocks from Lombard Street San Francisco. In addition to taking the cable car, you can also walk. Walk: If you decide to walk, your best option is to take either North Point or Bay to Leavenworth. 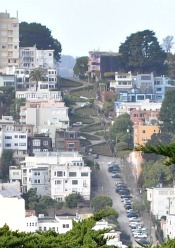 This gets you to the bottom of Lombard -- but its an easier walk than the steep hill on Hyde from the bay. 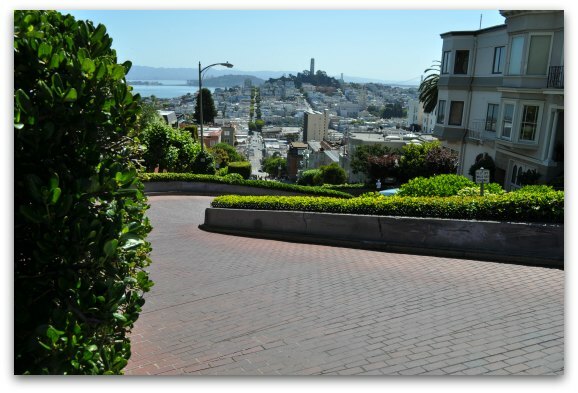 When you arrive, you can then take the steps up Lombard to see the beautiful views at the top. From Union Square: If you are staying in Union Square, you can also either take the cable car, a taxi or the bus. Bus: There are a few buses that get you within a couple of blocks of Lombard. Your first option is the 30 Stockton. Take this through North Beach to the Columbus and Lombard stop. You can also take the 45 Union bus. Get off at the Union and Leavenworth stop and walk up Leavenworth to Lombard. Both will take you about 20 to 25 minutes. Taxi: You can also take a taxi over to Lombard from Union Square. This takes about 10 minutes and will cost around $15 to $20. You can then head down to North Beach to pick up another taxi for your return trip.